Johnson & Johnson's stock history makes it one of the world's most profitable businesses, which should produce great returns for investors in the years ahead. This article was last published July 10, 2016 and updated September 30, 2016. Fortunately for shareholders, Johnson & Johnson (NYSE:JNJ) stock has performed extremely well over the past year. What’s more, Johnson & Johnson has, in fact, been one of the most rewarding stocks of the past decade – providing its owners with dividends, stock splits, and capital growth in its journey to boasting a market capitalization of over $300 billion dollars. While the past is no guarantee of future results, a thorough analysis of the consumer goods titans history and outlook points to continuing returns for investors. Indeed, Johnson & Johnson stock could be a buy for long term investors. When you're investing for the long term, it's helpful to consider businesses whose track records include tough operating environments. After all, if a company can thrive through past periods marked by recessions, inflation, and market turmoil, chances are good that it can navigate similar situations in the future. That's one of the key appeals of so-called Dividend Aristocrats, which have boosted their dividend payments for a minimum of 25 consecutive years. Consumer healthcare titan Johnson & Johnson meets that high bar -- and in fact, far exceeds it. The company has boosted its dividend every year since 1961, for an incredible 54-year streak. Originally founded in the late 1800s with offerings such as baby powder, sanitary napkins, and the first mass-produced dental floss, Johnson & Johnson has grown into a true global healthcare titan. Today it's the fifth-largest pharmaceutical company, the sixth-largest biotech company, and the sixth-largest consumer healthcare product seller in the world. Include dividends in the mix and the returns look even better. JNJ's dividend has risen from $1.28 per share a decade ago to $2.95 per share now, for a 9% annual growth rate. The stock's total return price, which includes reinvested dividends, amounts to a 175% return since 2005, compared to 100% of strictly capital gains. In either case, shareholders would have trounced the broader market's 65% rise over that time. To keep that momentum going, the company needs to continuously create new and improved pharmaceutical and healthcare products. That's the reason why it dedicates a whopping $9 billion to research and development spending every year. The good news for shareholders is that its track record on this score is impressive, considering that a full 25% of Johnson & Johnson's $70 billion of annual sales comes from products introduced in just the last five years. Besides ensuring market-thumping sales growth, the strong innovation pipeline explains why Johnson & Johnson is one of the more profitable companies on the planet. Its 70% gross profit margin ranks it (by that metric) No. 4 out of the 30 components in the Dow, and blows away rivals like Procter & Gamble (NYSE:PG) and 3M (NYSE:MMM). Just a few weeks after those remarks, Johnson & Johnson announced a 7% increase in its dividend payment, marking its 54th consecutive raise. Even with that boost, the dividend accounts for just around 50% of profits, which leaves plenty of room for future increases as earnings churn higher in the coming decade. 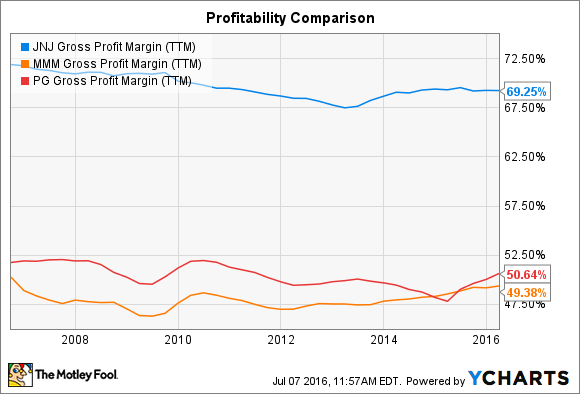 Yet the stock is valued at 18 times this year's profit, representing a nice discount for investors compared to 3M and P&G, which right now are both fetching roughly 21 times earnings.